The Q5 is our most affordable mattress to include our 3 piece cotton pillow-top cover. 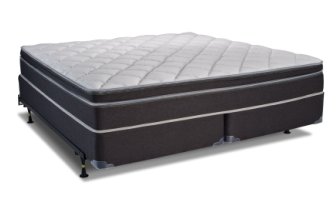 Beyond the premium top-cover, the Q5 includes a 2″ layer of convoluted foam for increased comfort and contouring above the air chambers, as well as the support layer of foam below the chambers. All Instant Comfort mattresses come standard with a state-of-the-art control system, which measure pressure on the standard medical mm/Hg scale. Our completely customizable two-sided-system allows for both sides of your mattress to be adjusted through touch screen controllers on both sides of the bed. Pillow-top covers are completely removable, and professionally launderable to ensure years of clean, comfortable sleep. Twin​: 39" x 75" x 10.5"
Twin XL: 39" x 80" x 10.5"